**Amazing pre-Throbbing Gristle recordings!!! 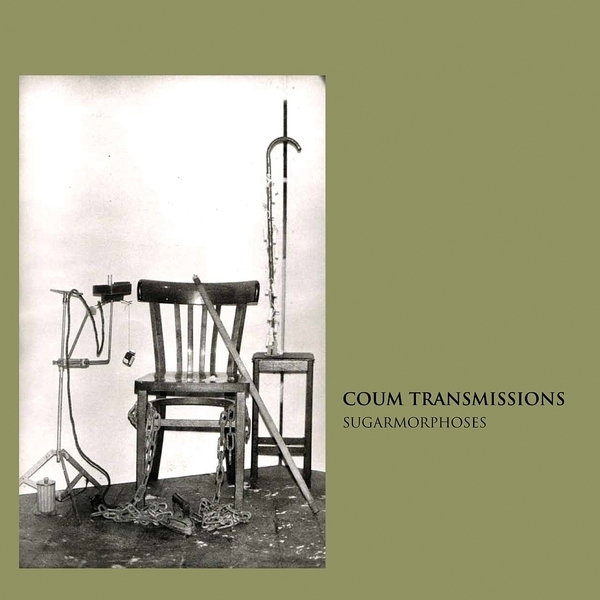 ** Dug out from the archives, 'Sugarmorphoses' documents Genesis P-Orridge in her earliest artistic guise, COUM Transmissions, recorded at their HQ, the Ho Ho Funhouse in Hull circa 1974. Pre-dating their most infamous 'Prostitution' swansong show of 1976, by all rights it's something of an important and prescient historical artefact showcasing the devious early imagination of one of modern music's most singular characters. The pull-out insert gives some context to their situation, surrounded by Hells Angels, drugs and breadline living conditions in a derelict house, all written in typically entertaining fashion by Genesis. And the music? Well, it's ragged and compelling, featuring Gen at the piano playing hypnotically warped improvisations overlaid with scratchy, cut-up field recordings off old dictaphone tape, finding an uncanny balance of chaotic arrangement and something more steady, and weirdly cohesive which engages the imagination. There's no way you would call it academic, but it is defiantly, intuitively experimental and playfully tactile with a warped sense of space and time, texture and tone which can be traced through his later work. For fidelity assurance, the tape transfer was handled by Aaron Dilloway, audio restoration and editing by Hospital Productions associate Kris Lapke, and mastering by Josh Bonati. Highly Recommended!